A former Governor of the Central Bank of Nigeria, Prof. Charles Soludo, has urged President Muhammadu Buhari to ensure the immediate release of the leader of the Indigenous People of Biafra, Nnamdi Kanu. In a statement published by The Punch , Soludo said this in Abuja on Thursday at the presentation a book entitled, ‘The Politics of Biafra and the Future of Nigeria,’ written by Chudi Offodile. The former CBN governor said Kanu was not popular until security agents arrested him last year.He recalled that Chief Obafemi Awolowo was imprisoned for treason in the 1960s, but this caused him to be loved even more among the Yoruba. 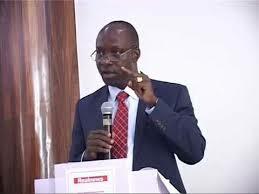 Soludo said Kanu’s prolonged detention would make him a hero or a martyr, which would not stop the current Biafran agitation.The ex-CBN governor warned that if Kanu was not released, his detention could be used as a campaign tool in 2019, just as the pardoning of Dim Chukwuemeka Ojukwu was used by Shehu Shagari to gain support in the 1980s. Other prominent Nigerians at the event included a former Minister of Transport, Osita Chidoka; former Vice-President Alex Ekwueme; a former Deputy Speaker of the House of Representatives, Emeka Ihedioha; and the Bishop of Sokoto Diocese, Bishop Matthew Kukah.